I have always lived by the "never buy a guide for a country outside of that country" saying. Whether it's a map, tourist guide, or language guide, it's pretty much guaranteed to be better quality and more accurate if you buy it when you arrive at your destination. However, it is also important to prepare before you leave to go to said other country. You may know quite a bit about the culture you are about to jump into, or you may not, but that depends on the individual. 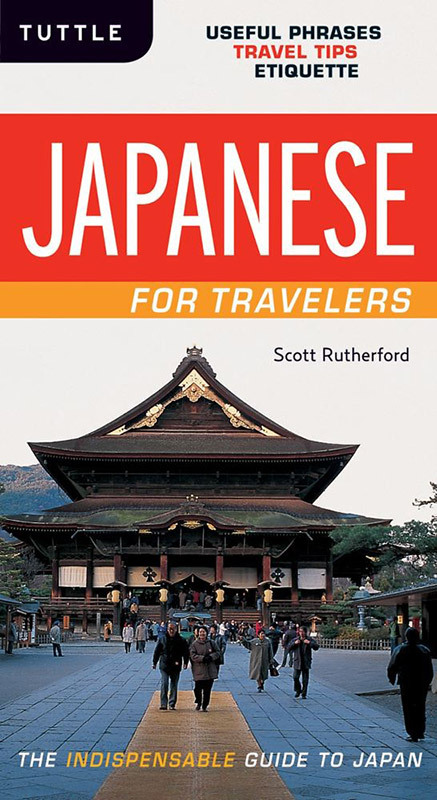 With that in mind I read through Tuttle Publishing's Japanese for Travelers by Scott Rutherford. This book covers the basics of Japanese grammar and pronunciation, how to get around, make calls, send mail, and more. They may be the basics, but they are important things that you need to know if you are going to be spending any length of time in Japan. They are some of the first things you learn about in Japanese language and culture classes, but not everyone is fortunate enough to be able to attend classes on the subject. They are also things you can read about online, but having all of the information bound together in a fairly small sized book can be more convenient for someone on the go. 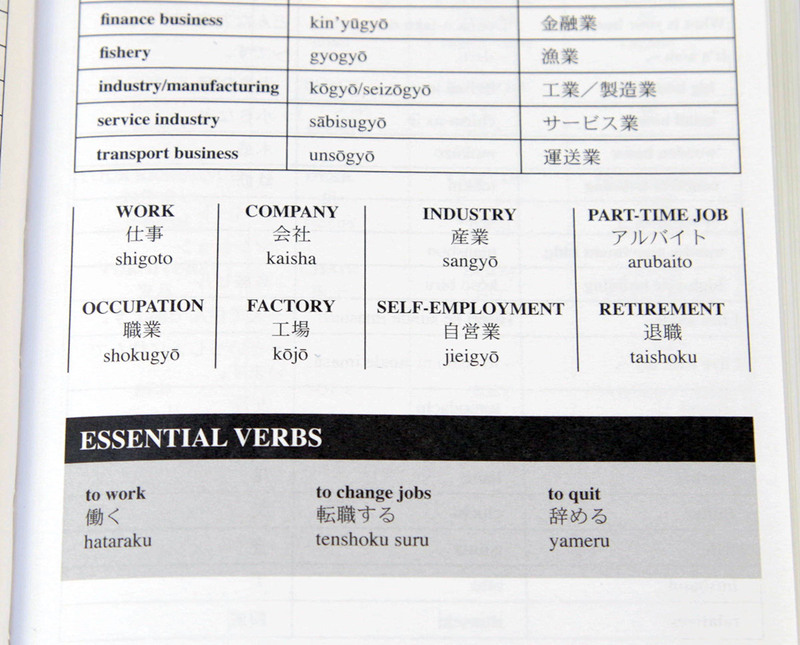 Each section contains useful Japanese phrases for each situation. They also have vocabulary you may encounter as well as "Essential Verbs" which truly are essential if you want to speak Japanese and not English. It gives the English, romaji, and kanji/kana for each word and phrase to help you recognize, say, and understand them. 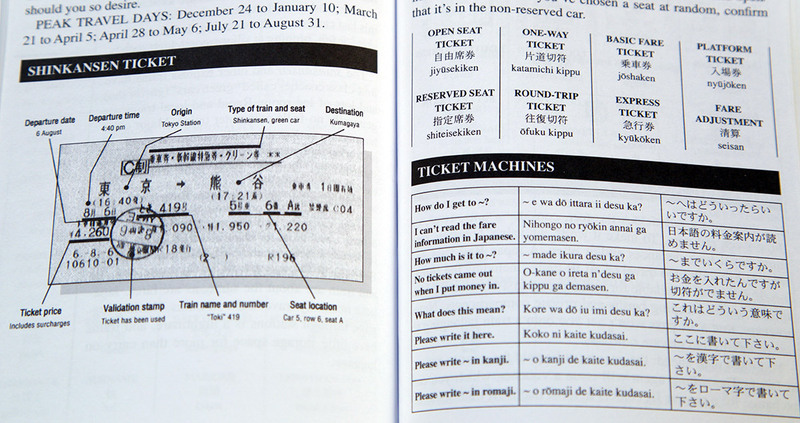 Japanese for Travelers was published in 2009, which feels recent to me still, but I can see some of the information on train tickets and how to read specific signs becoming obsolete in time. As with any guide, when a new version comes out, you should always upgrade. Luckily, a lot of the information in this guide stays basic enough where it shouldn't need to be redone for some time. For instance, how to politely ask someone to help you find what you are looking for will always be useful. Or a list of the major cities and their Kanji so you can find them on maps and schedules. One thing that is missing from this guide is how to use bathrooms, or where or how to buy things like feminine health products. While this may seem awfully specific to some, since this guide tends to stick with the very basics, for a woman, knowing where to buy feminine care products is one of the basics. There are Japanese style toilets in even the most major airports in Japan, so explaining the difference between the toilets you may be used to and the lovely oval holes in the ground is kind of important. Knowing how to go to a hospital isn't going to help when you can't figure out how to relieve yourself. Also, while Japanese for Travelers boasts it is "the indispensable guide to Japan" it really isn't. You can easily go to Japan without reading this book and still have a great time, avoiding any unfortunate faux pas or run ins with the police. You just need to do your own research. The internet is a treasure trove of information on the subject of travel and culture, especially to Japan. If you've taken a basic Japanese culture class and beginners Japanese, you probably know a lot of the information in this book. Another problem I have with it, and this may not be the case with other people, but the constant use of romaji drives me nuts. I know that seems to be the way to do things with a lot of beginners, but I would love it if there was furigana included as well. As someone who never really used romaji, having to wade through it when I'm trying to figure out the reading of the word is a huge annoyance. Plus, encouraging people to learn hiragana is going to be a big help to them when they go to Japan. It doesn't take all that long, either. You could do it on your airplane ride over. 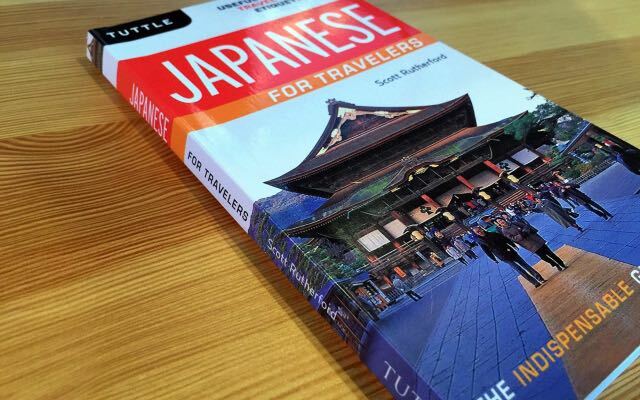 Japanese for Travelers would be a good read on the plane before you get to Japan but that is probably the extent of its usefulness. While it may not go in depth on any particular subject, it does a pretty decent job of covering most of the basics of travel and the differences someone unfamiliar with Japan will encounter. 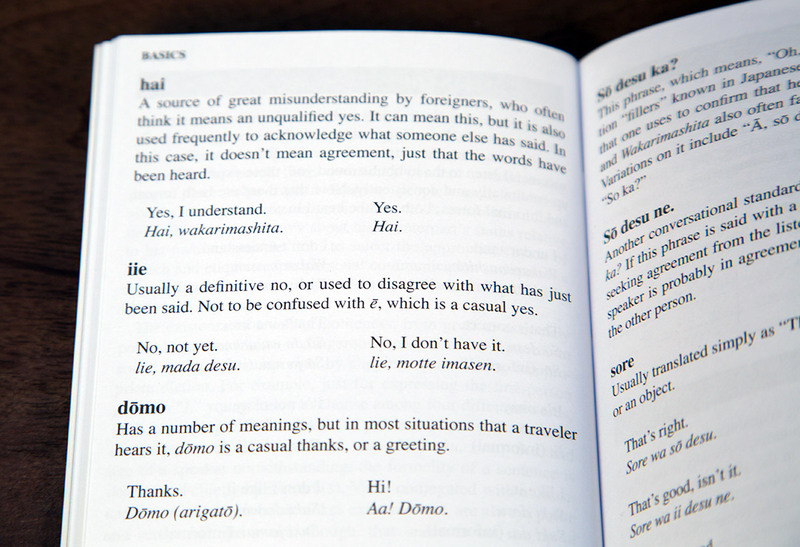 The Japanese it provides is the bare bones stuff that you need to know if you don't have any prior Japanese knowledge and you want to spend some time in Japan speaking Japanese instead of English. But I can't really see why someone would do that. While it's not made to teach you Japanese, it does give you a number of tools to use to make it through if you can't find anyone who speaks your language and you need help. Some first time travelers may find this useful but I honestly can't help but smirk when it calls itself "indispensable." Maybe it is the fault of the marketing department and not the author, but you don't need this guide. If you are the kind of person who likes to over prepare, fine, buy it and read it before you leave, but this is definitely not something I would recommend anyone buy if they already know a thing or two about Japanese culture or the Japanese language. Just buy a guide when you get to Japan. It will be 100% more helpful and accurate.